What would you say if we told you document production can amount to 3% of your company’s total turnover*? To tackle spiraling costs, efficient document generation is essential. 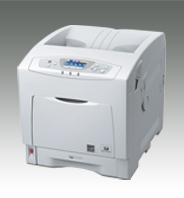 Designed with your office needs in mind, the SP C420DN keeps Total Cost of Ownership to an absolute minimum. Producing top quality colour prints at high speeds, this advanced colour print solution gives you a true competitive edge. * Source: infoSource & Dataquest. Superb productivity: short warm-up and high print speeds. Exceptional paper handling and media support.